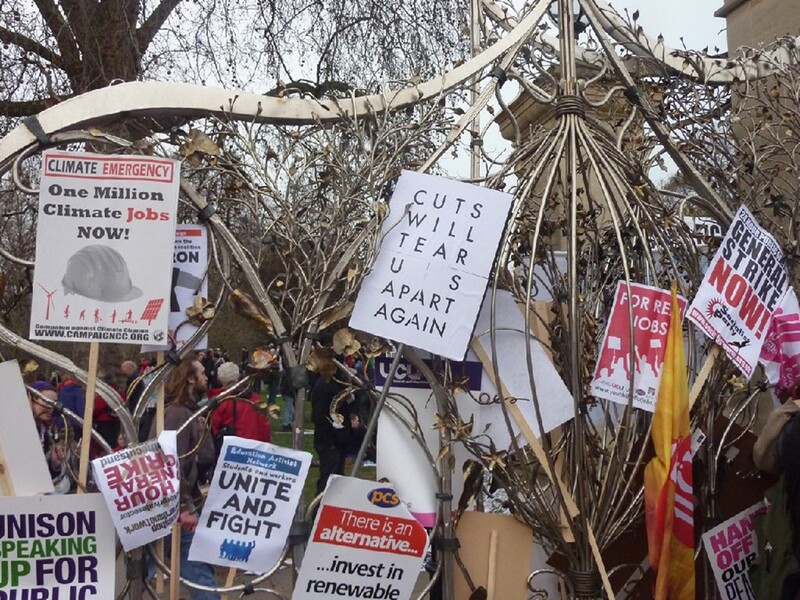 Questions mount up after the TUC march on Saturday 26 March – were anti-tax avoidance group UK Uncut right to stage a direct action at the same time as the Hyde Park rally? Were they naive not to foresee that occupying Fortnum & Mason's would attract the attention of the black bloc? Has their non-violent movement been tarnished in the eyes of the mainstream as a result? And why did the police arrest so many peaceful protesters inside the shop, only to later drop charges of criminal damage, while masked protesters smashing up shops and banks were left relatively unchallenged? Whatever the answers, UK Uncut's fundamental assertion remains that corporate tax avoidance is a scandal that must be addressed, especially in the light of the government's programme of cuts. Back in February, I spoke to author Nicholas Shaxson about his book Treasure Islands: Tax Havens and the Men that Stole the World, and the reasons behind UK Uncut's campaign. This interview is slightly extended. Or uncut, if you will. If Goldman Sachs is famously a “great vampire squid wrapped around the face of humanity”, the offshore tax system is an unimaginably vast spider’s web of corruption that has ensnared the planet. British journalist Nicholas Shaxson has published a book that has blown wide open the secretive world of tax havens and “offshore” finance, which enables the rich to pay less tax while the rest pay more, further impoverishes the third world and lies at the heart of our ongoing economic crisis. Luckily for us, he’s also very good at explaining this all in words that we can understand. Dazed & Confused: So, I consider myself a reasonably numerate person. Yet the more I read about economic issues, the more confused I become. Is this stuff just really bloody difficult? Nicolas Shaxson: In a word, yes. It’s absolutely baffling to everybody! Having spent a lot of time researching the offshore system, it’s one of those things that the more you know, the less you know. The essential principles of offshore are very simple – these are places that provide escape for mostly wealthy elites from laws and taxes and regulations they don’t like, leaving everybody else to pay their taxes for them. So, there are simple principles, but the actual details of what’s going on are incredibly complicated. And I do think that the people who are big players in this system like it that way. It seems as though people are waking up to what is going on, partly due to movements like UK Uncut. But to take a pessimistic viewpoint, what hope is there for a protest movement when the details are so complex that the average person finds them difficult to understand, let alone argue against? That is a big worry for everybody, and is one of the reasons why this system has been hidden for so long. But again, the principles of what is going on are absolutely clear, and UK Uncut has tapped into something absolutely fundamental. What encourages me is that even ten years ago, nobody was paying attention to this offshore system. In the last four to five years, there have been the beginnings of interest in this issue, mostly at quite a wonkish level, but this has been bubbling up. I’ve been watching it grow, and it’s grown very fast. UK Uncut is a new phase – something that exploded on to the streets, which is absolutely fantastic. We’re at a fairly early stage of the process, and UK Uncut is looking at one particular aspect of this system, which is corporate tax avoidance – a very important part of it – but what is really out there is much more all-encompassing. And Britain has a particular role in this global offshore system, there’s no disputing that Britain is responsible for about half of the tax havens in the world. When UK Uncut were on Newsnight [the first time], the counterargument put to them was that we should actually lower corporation tax, as that might then persuade companies to come back and be more willing to pay tax – what do you think of that? This has always been the argument, but it’s not so much an argument as a threat. It’s a way of saying, ‘Give us what we want or we’re going to go elsewhere.’ First of all, it’s empirically not true that is what happens, that if you lower taxes, tax evasion will fall. And secondly, it’s profoundly anti-democratic to threaten elected politicians that if you don’t do what we the corporations want, we’re going to go elsewhere, so you better do what we say. I think it’s an appalling argument to make. Yet it terrifies governments, who won’t call their bluff. Politicians always quail – you see it again and again in Britain. And then when the bluff is called, you’ve had all these screams from people saying, ‘We’re going to run away to Switzerland,’ but if you look at the numbers, it’s a small trickle. I think politicians should call their bluff a lot more. These companies say the protesters are mistaken… Vodafone say it’s an urban myth they owe this money. The urban myth thing is always wheeled out and there is what some of us call the Phillip Green defence: which is, no tax was avoided because no tax was due. But what he doesn’t say is that no tax was due because I put a lot of effort into making sure that no tax was due. So, it’s a whole slippery game that’s going on here. And this urban myth thing is quite wrong – they will say that, because what you have when multi-national corporations use aggressive offshore strategies to cut their tax bills, you have, at the far extreme of it, tax evasion, which is illegal activity, and at the other end, tax avoidance, which is by definition legal. But also, by definition, avoidance is getting around the spirit of legislation. And in between these two poles, you have this huge grey area. So, they can construct an argument that says ‘technically we have not broken any laws here, look at what we’ve done.' But in fact, if you look at what they SHOULD pay, according to what democratic society wants, then you get a very, very different picture indeed. So it’s not an urban myth, and the Vodafone story for example, the research was done by a former top HM Revenue & Customs corporate tax official who really is one of the best in the business, there’s no question that this is serious money we’re talking about, and when they say it’s an urban myth these are just word games they’re using to try and justify what they’re doing. Why do you think tax havens are such an important issue right now, and why do you think it’s a subject that hasn’t really come to light until recently? Tax havens have been completely under the radar for such a long time, partly because there has been this perception – that I think has been deliberately encouraged – that these are just places for Mafiosi and celebrity tax dodgers, but the fact is that these are now at the heart of the global economy. Depending on how you measure it, the figures are absolutely staggering. Half of world trade passes through tax havens in one way or another. Huge, huge amounts of money are involved – every multinational corporation pretty much these days will have offshore subsidiaries they use for various reasons… cutting down tax bills is usually top of the list. And in every survey, the top ranking companies in terms of numbers of subsidiaries in tax havens, it’s always the banks. The banks are right in there, so this is the heart of the financial system. I am still a little bit mystified as to why it has been so far under the radar. I think there are many different reasons. I mean, complexity is obviously a part of it. Perhaps it’s a case of not being able to see the wood for the trees? Something so big it’s hard to see or believe. That may at the end of the day be the best explanation of all. People can only ever see a little bit of this at a time. There’s no magic bullet. People often ask me this, and the first answer I give is that we are still at a phase where we don’t even have the education about the system to know what to do about it – there needs to be widespread, public understanding. Because the system is so complicated, that if a journalist wants to write about tax, then they’ll ring up somebody from KPMG or one of the big accountancy firms. And these firms, their business is to design strategies to help their clients avoid tax! And so they have developed this worldview that tax is bad and offshore is good. So, journalists ring these people up, and this worldview then gets propagated into the public consciousness. And that hasn’t really, until very recently, been properly challenged. That’s starting to happen, not just as a result of UK Uncut, but also wider issues such as the financial crisis making people question all their assumptions. As for the rest of it, it’s not something where there is one solution – there are lots of different ways to slice this. Where do you think Wikileaks fits into this picture and the discs that have been handed over with the banking details from a Swiss bank? I think it’s Elmer’s story that is the most interesting part of this debate. He is a Swiss banker who worked in the Cayman Islands and got to a very senior position with a Swiss bank, learned a lot, and eventually decided to blow the whistle. And he is now in prison in Switzerland for breaking Swiss bank secrecy. So it’s a very bizarre situation we’re in. Almost certainly it is bona fide stuff – I spent time with Elmer, he is a fascinating guy who is very highly qualified. There’s a battle of ideas going on here, where jurisdictions like Switzerland are saying it’s a crime to steal data, and where people like Elmer and myself would say it’s a crime to evade billions of dollars of taxes. But now, countries like Switzerland, with the collusion of places like the UK, are working very hard to find ways to stop this from happening. They’ve been very nasty indeed to Elmer, and I don’t know what’s going to happen to him now that he’s in prison. I don’t think this is a game-changer unless we get a whole rash of whistleblowers, but I think it’s an important signal to people telling them something awful is going on here. But these will only be very anecdotal pictures in a much bigger system of crime and abuse. Could it be the start of a trend that more people will come forward to crack the system open? Places like Switzerland are trying to make it very unpleasant for whistleblowers, so there is fear out there as well. Is it the start of a trend? I know growing numbers of people that work in this sector are becoming more uncomfortable. Last night, I gave a talk at Chatham House about financial secrecy, and somebody came up to me afterwards who works for a private bank, essentially apologising for what she was doing, saying, ‘Yes you’re right, this stuff is happening and I’m doing it, and I feel really bad about it.’ Whereas a few years ago, there was not really much questioning of this whole system – it was accepted that secrecy is good and the crime is to reveal information to law enforcements, a bit of a Mafia code of honour. I think there are now a lot more people talking about how rotten this system is. I think a lot more people are feeling uncomfortable in these jobs, and I am hopeful that there will be a lot more revelations and people coming forward to explain what the system really looks like.